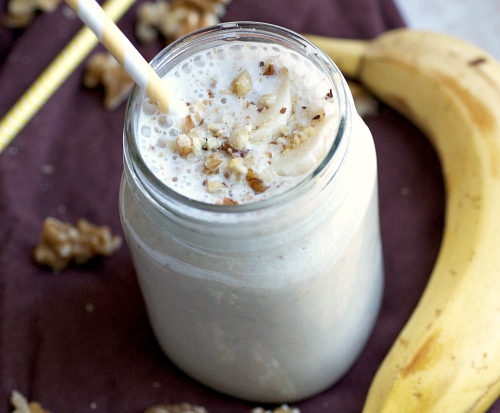 This luscious banana nut smoothie is the perfect healthy, protein-packed and delicious breakfast for when you’re on-the-go! Plus, it’s a drink that tastes like banana bread, what’s better? Eat. Sleep. Cookbook. Repeat. That’s my life until October 7th. I’m REALLY feeling good about the recipes and I’m almost done whipping them up. But you see, the cooking is the easy part. The hard part? Writing it. Which really shouldn’t be so hard since I’m, ya know, a writer. But it is. This isn’t just another blog post that I can quickly go in and edit. My words are going to be immortalized, written in stone, stamped to my forehead for the rest of eternity. If you think “shoot, I sound really stupid in that intro” you can’t just go in and change in when you’re feeling dashing. You can’t change anything. Don’t worry, that won’t be in the book. But heavens do I wish this banana nut smoothie was going to be. I’m too late in the game to make revisions, but I WISH I had made this one before. So creamy, so luscious, so protein and antioxidant packed, this is the world’s most powerful (and absolutely delicious) smoothie. 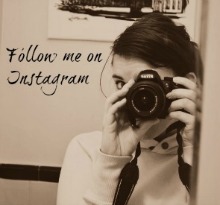 I promise you that. If you’re worried about the carbs or fat, don’t be. You won’t be hungry until dinner after this (trust me). Now, if you’ll excuse me, I have 6 recipes to make, photograph and write about. If you could be so kind as to shoot a coffee IV my way, that’d be fabulous. 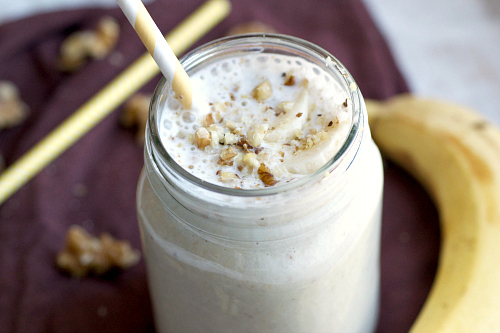 Place the banana, oats, almond meal, milk, greek yogurt, cinnamon, honey and about 1 1/2 tablespoons walnuts in the blender. Blend until completely smooth. 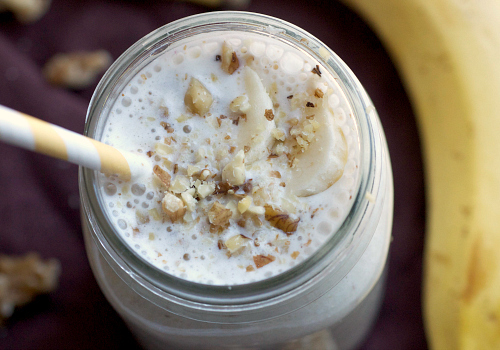 Pour the smoothie into a jar and garnish with crushed walnuts and a few banana slices. Love this smoothie! Making it for breakfast tomorrow! Yep...I pretty much want this right now. Love the almond meal addition! I, too, am a last minute gal. I do my best work under pressure. This smoothie looks perfect! Mmm! I only recently discovered that I love banana bread, so I'm a little obsessed. This looks delicious! Totally scrumptious! I love this smoothie! 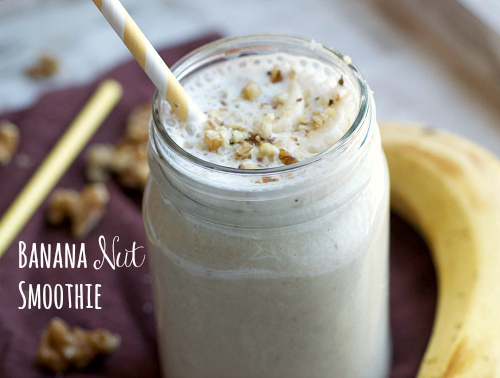 Wow - this smoothie sounds and looks delish! I definitely have to try this smoothie. Good thing I bought bananas at the grocery store yesterday! I'm a big fan of smoothies for breakfast and am always looking for new ones. This one sounds delicious and different from all the other recipes I've found. Looking forward to enjoying it. Thanks for sharing your thoughts on feiss lighting. taboo matter but generally people do not discuss such topics. hey babes, is this smoothie high in vitamin B1?